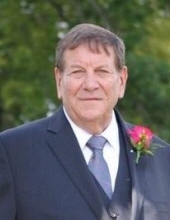 Paul Jerry Dawson, 78, of Frankfort, KY, passed from this world to his heavenly world on Monday, February 4, 2019 after a long illness at Frankfort Regional Hospital surrounded by his loving family. Born on March 12, 1940 in Owen County, son of the late Wildean and Howard Dawson. A graduate of Owen County High School and a member of Forks of Elkhorn Baptist Church. Jerry was an avid fisherman, hunter, gardener, rook player, and UK sports enthusiast. He enjoyed cook outs, family gatherings, playing golf, listening to his favorite music, and especially spending time with his children and grandchildren. He was preceded in death by his brother, Howard Dawson, his son, Paul Dawson; and a long time dear friend, Bill Lewis. Along with his wife of 47 years, Faye Dawson, he leaves behind, a sister, Dorothy Sutherland; his children, Chad (Stephanie) Dawson, Ryan (Stephanie) Dawson, Dena Dawson (Steve) McNabb, Raegan (Jeff Murphy) Dawson; his grandchildren, David, Kelly, Katelyn, Ashley, Andrew, Emilie, Patrick, Riley, Hannah, Taylor, Logan, Madison, and Caroline; his great grandchildren, Ashton, Hunter, Anthony, Elliott, and Elijah; as well as numerous nieces and nephews. Funeral service will be held at 11:00 am on Friday, February 8, 2019 at Clark Legacy Center, Versailles Rd. Rev. Todd Lester, Bro. Rick Clark, and Damon Moberly will be officiating. Burial will follow at Sunset Memorial Gardens. Serving as casketbearers will be Chad Dawson, Ryan Dawson, Steve McNabb, Jeff Murphy, David Dawson, and Randy Dawson. Honorary casketbearers will be Ron McEwen, Andrew McNabb, Bradley Sutherland, Sonja Sutherland Stipes, Taylor Murphy, and Logan Murphy. Gathering of Family and Friends will be held from 4:00pm until 8:00pm on Thursday, February 7, 2019 at Clark Legacy Center, Versailles Rd. In lieu of flowers, memorial contributions may be made to Forks of Elkhorn Baptist Church. To send flowers or a remembrance gift to the family of Paul Jerry Dawson, please visit our Tribute Store. "Email Address" would like to share the life celebration of Paul Jerry Dawson. Click on the "link" to go to share a favorite memory or leave a condolence message for the family.